Surprising, adventurous, even wondrous bass flights —Solo Flights —without overdubs or edits —from Lynn Seaton, a musician known for his work with Woody Herman, Count Basie, Kenny Drew Jr and George Shearing. Filled with sinewy, soaring archi, orchestrally luxuriant excursions, and driving improvisations, the record ranges from the funky, rock-influenced "Ode to Jimi" to the Flamenco-flavored "Barcelona" to Coltrane to down 'n' dirty swing. Seaton explores all corners, shades and facets of his instrument on this tour de force. Buy Solo Flights now at the OmniTone store. 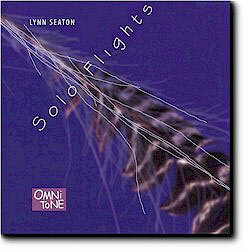 All compositions by Lynn Seaton, Bassman's Basement/BMI , except as noted. Recorded 1996 at Electric Fields Studio, Warwick NY. Recording engineers: Mark Egan, Jeff Ciampa.